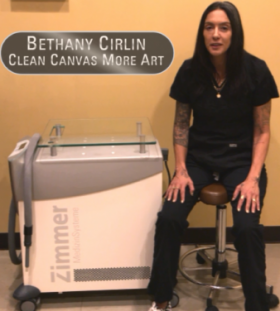 Bethany Cirlin, Owner and Operator of Clean Canvas More Art, uses a Zimmer Cryo 6 device to help manage potential pain from laser tattoo removal and tattoo lightening. Bethany Cirlin shared the below video and comments about Zimmer Cryo technology without compensation. Scroll down to view the testimonial / treatment demonstration video. Familiar with the feeling of being unhappy with many of her own tattoos, Laser Specialist, Bethany Cirlin opened Clean Canvas More Art in 2007. She recognized as a client and as a technician, the need for more accessible, more affordable tattoo removal and lightening services in the NYC area. Today, Clean Canvas More Art offers appointments at two locations. One in NYC and another in Westbury, Long Island. The locations offer laser tattoo removal using HoyaConBio Medlite C6 and Syneron Alex Triadvantage lasers. These lasers are capable of successfully treating skin of all types and tones and also removing most tattoo ink colors. Their laser treatment is precise enough to remove portions of a tattoo without compromising the rest of it. Clean Canvas More Art also specializes in tattoo lightening, which provides a clean canvas for the enhancement of existing tattoos. The company’s website displays a variety of impressive before/after tattoo removal images. To learn more, visit them online at www.cleancanvasmoreart.com. For more information about Zimmer Cryo devices, please view a web overview of the product. You may also contact Zimmer any time by phone or email.